November | 2011 | Paul's Voyage of Discovery & Etc. The PTC Arrives on Wikipedia. Fans, friends and former members of The Practical Theatre Company can now celebrate another PTC milestone: The PTC has made it to Wikipedia. 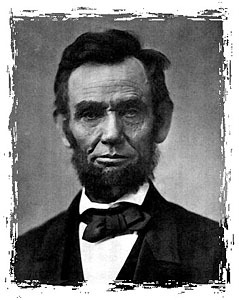 Lincoln’s Proclamation of Thanksgiving: Context, Conflict and Commemoration. 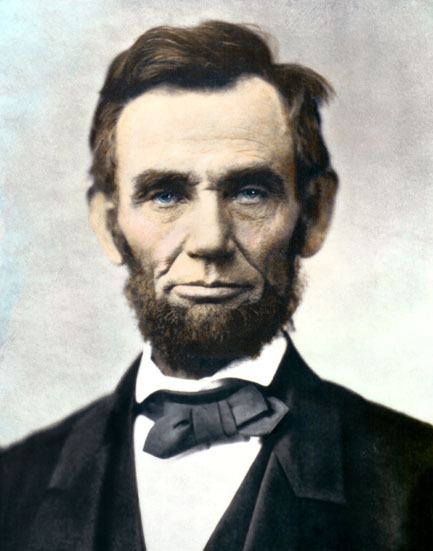 Abraham Lincoln issued the Presidential proclamation that set the precedent for our national day of Thanksgiving on October 3, 1863. On that date, America was just past the halfway point in the Civil War. The great Union victories at Gettysburg and Vicksburg in July of ‘83 had raised hopes in the North that the Southern rebellion was doomed – but two months later, the Confederate victory at Chickamauga proved that the war was far from over. 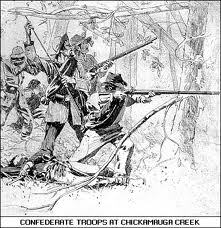 The Battle of Chickamauga, September 19 and 20, 1863, were the two bloodiest days in American history. Chickamauga claimed the lives of 1,657 Federal troops — with 9,756 soldiers wounded and 4,757 missing for a total of 16,170 casualties out of 58,000 troops. Confederate losses were just as steep: 2,312 dead, 14,674 wounded and 1,468 missing for a total of 18,545 out of 66,000 troops. It was only the courageous rear-guard stand of Union General George “Pap” Thomas – the legendary “Rock of Chickamauga” – that kept the Federal army from suffering a total rout in northern Georgia — and set the table for a Union victory at the Battle of Missionary Ridge two months later on November 25, 1863. Today, though the Occupy Wall Street movement is provoking a healthy dialogue about the plight of the 99% versus the insane, unbalanced power, influence and affluence of the 1% — America is not embroiled in a civil war on the scale of the 19th Century War Between the States. 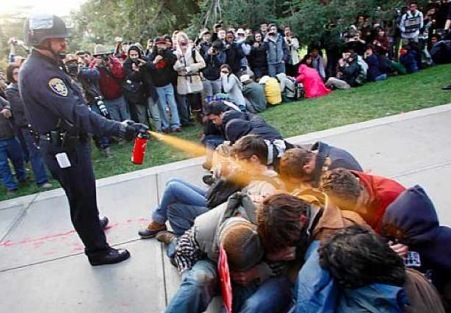 But, with pepper spray, police “batons”, riot gear, and other forms of authoritarian violence being directed against ordinary Americans seeking freedom and social and economic justice — it’s not entirely beyond the pale to suggest that this year’s Thanksgiving celebration falls on a date fraught with historic significance. 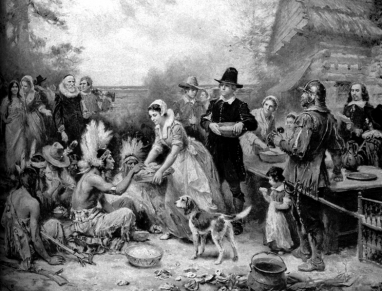 So today, November 24, 2011, let’s remember why Abe Lincoln established Thanksgiving as a national holiday in a much more desperate and pivotal moment in our national history. 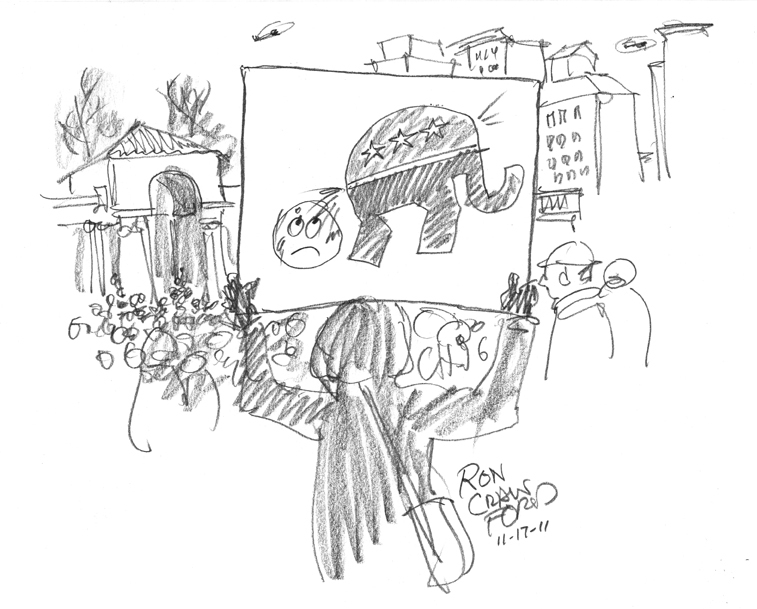 And let the Occupy Wall Street movement dine on turkey today — and draw strength for the battles ahead. Needful diversions of wealth and of strength from the fields of peaceful industry to the national defense, have not arrested the plough, the shuttle or the ship; the axe has enlarged the borders of our settlements, and the mines, as well of iron and coal as of the precious metals, have yielded even more abundantly than heretofore. Population has steadily increased, notwithstanding the waste that has been made in the camp, the siege and the battlefield; and the country, rejoicing in the consciousness of augmented strength and vigor, is permitted to expect continuance of years with large increase of freedom. No human counsel hath devised nor hath any mortal hand worked out these great things. They are the gracious gifts of the Most High God, who, while dealing with us in anger for our sins, hath nevertheless remembered mercy. And god bless the Occupy Wall Street Movement! If you don’t have your tickets yet – you can get them here. See you at Mayne Stage for the holidays! And fans of Riffmaster and the Rockme Foundation should check out closing night, December 30th – when Riff and the boys are going to cap the run with a rocking closing night celebration. 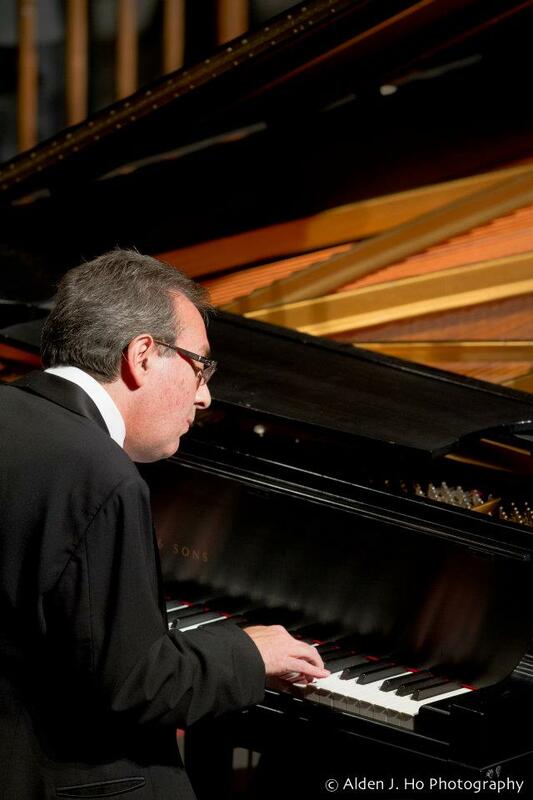 Don’t miss the broadcast of Larry Schanker’s first piano concerto on radio station WAUS this Sunday, November 20th at 6:00 PM Michigan time. 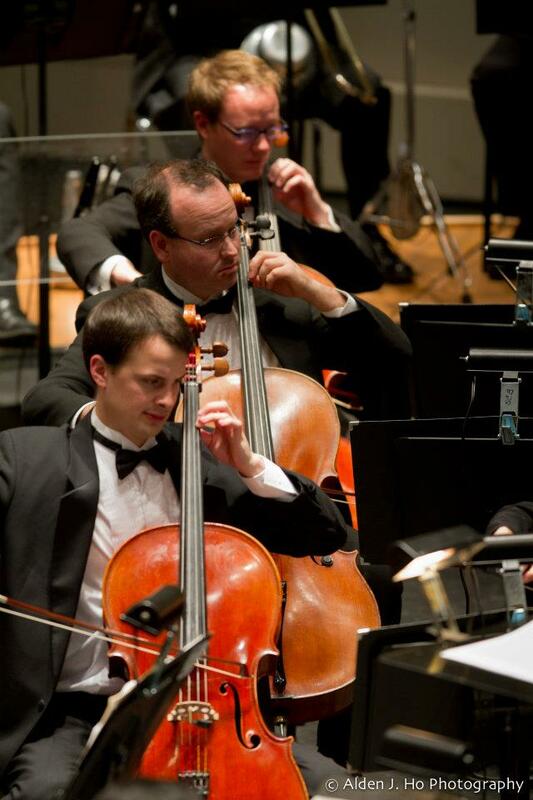 Photo credit: All photos of the Southwest Michigan Symphony Orchestra by Alden J. Ho Photography. 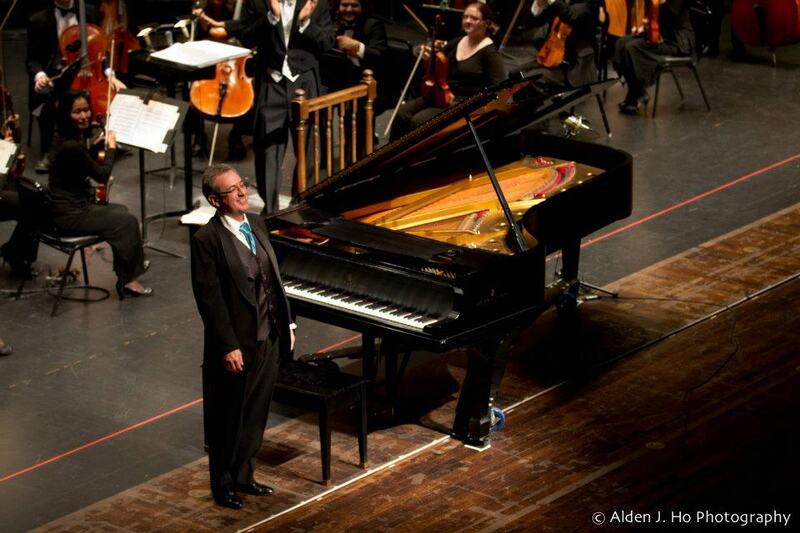 I am delighted to announce that our good friend, the amazingly talented pianist and composer, Larry Schanker, has performed his first piano concerto — Concerto for Jazz Piano — with the Southwest Michigan Symphony Orchestra. Better yet, we’ll all get a chance to listen to it on Sunday November 20th – by clicking this link at 6:00 PM Michigan time. 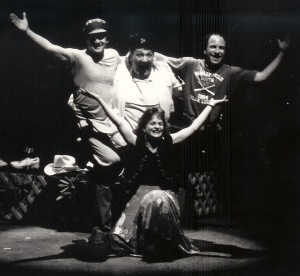 Larry was the Practical Theatre Company’s first musical director, and played keys for our comedy revues at the Piper’s Alley Theatre: The Golden Jubiliee, Megafun and Babalooney (with Rockin’ Ronny Crawford hitting the skins.) Larry also worked with us on the development of our musical, “Rock Me!” for the Columbia College New Musical project in 1988. He’s also a lifetime member of Riffmaster & The Rockme Foundation. 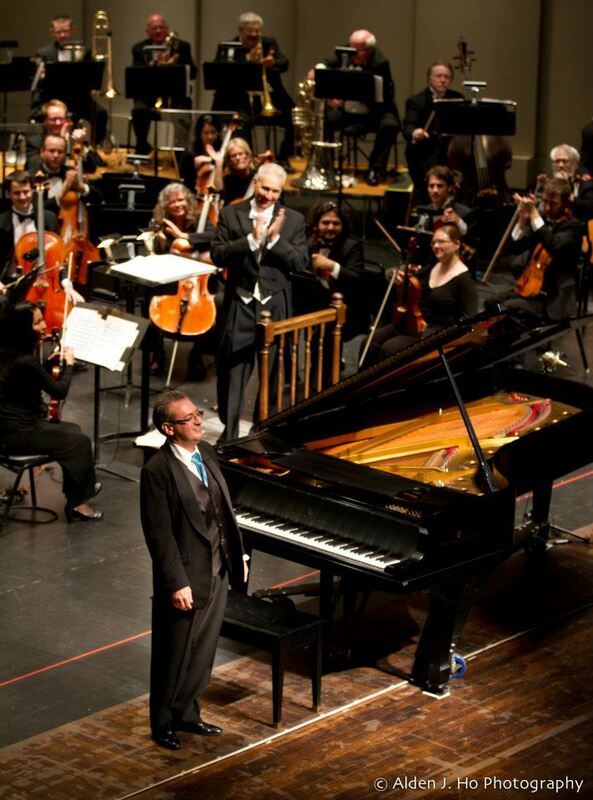 On Sunday, Larry’s performance with the Southwest Michigan Symphony Orchestra will be broadcast on a local Michigan university radio station, WAUS. Larry says it may only be accessible in real time. Techincal note: Mac users will need an updated version of Flip4Mac, the program that enables Quicktime to read Windows Media Player files. 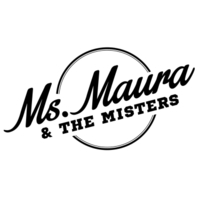 Here’s a link to the concert program and program notes. Larry’s on the bill with some guys named Aaron Copland and Dvorak. So, tune in to Larry’s concerto Sunday evening and get a taste of the talent that so many of his friend have marveled at over the years. A billionaire autocrat orders his police force in riot gear to clear a public square of peaceful demonstrators in an early morning raid. This riot squad makes dozens of arrests and destroys the protestors’ personal property. The authorities also muzzle the press, confiscate cameras, order news helicopters out of the airspace above, and arrest journalists in an effort to keep news of this suppression of free speech and the right of assembly out of the morning papers. This must be an old story out of Egypt or Libya, right? Or did it happen yesterday in Syria or Yemen? No, sadly. It happened here. 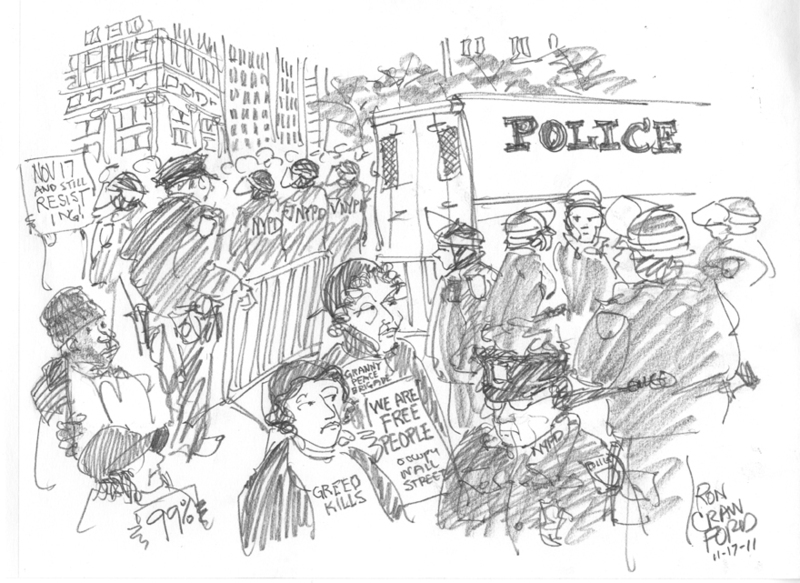 At one o’clock in the morning on November 15, the NYPD announced that OWS protesters had to vacate Zuccotti Park with their belongings so that it could be cleaned. Following that announcement, hundreds of cops in riot gear raided the park. 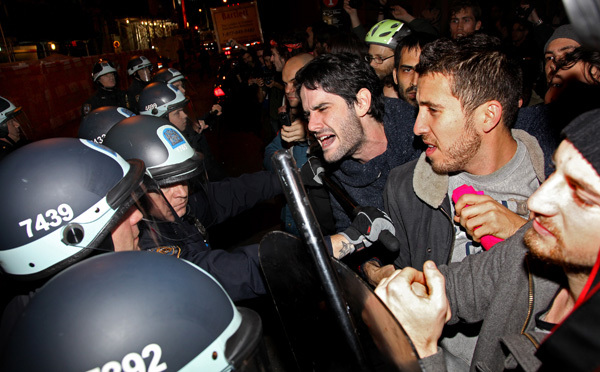 About 200 people were arrested: 142 in the park, another 50 to 60 nearby – including many journalists, despite their press credentials. 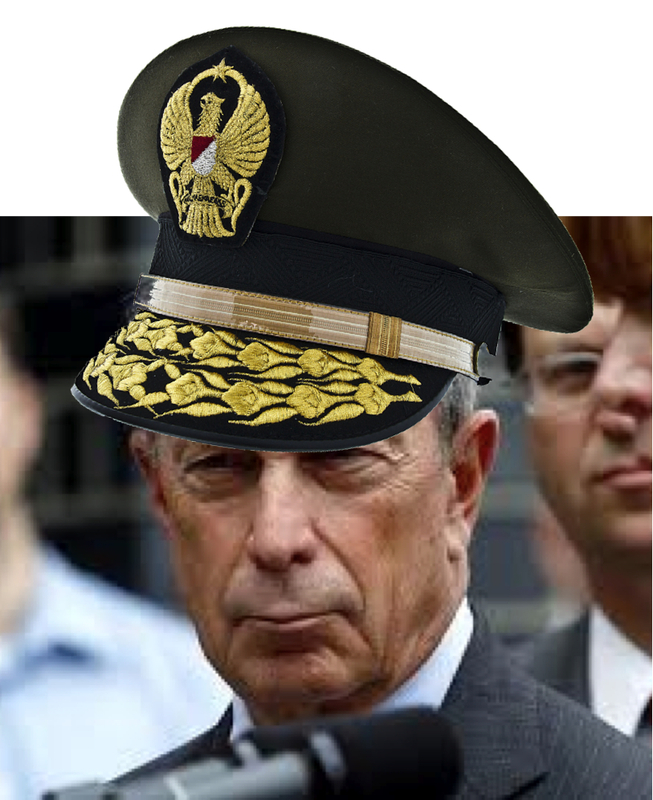 The problem for El Presidente for Life Michael Bloomberg – who should be paying more attention to recent history — is that such authoritarian tactics cannot stop a truly popular movement. Even as cops and the sanitation works trashed the tents and occupied the park, the Occupy Wall Street media team was already issuing a statement saying, ”You can’t evict an idea whose time has come”. The statement continued: “This burgeoning movement is more than a protest, more than an occupation, and more than any tactic. The ‘us’ in the movement is far broader than those who are able to participate in physical occupation. The movement is everyone who sends supplies, everyone who talks to their friends and families about the underlying issues, everyone who takes some form of action to get involved in this civic process. 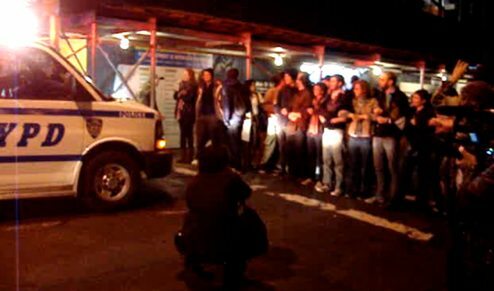 Within hours of the raid, the National Lawyers Guild obtained a court order allowing OWS to return with their tents to the park. 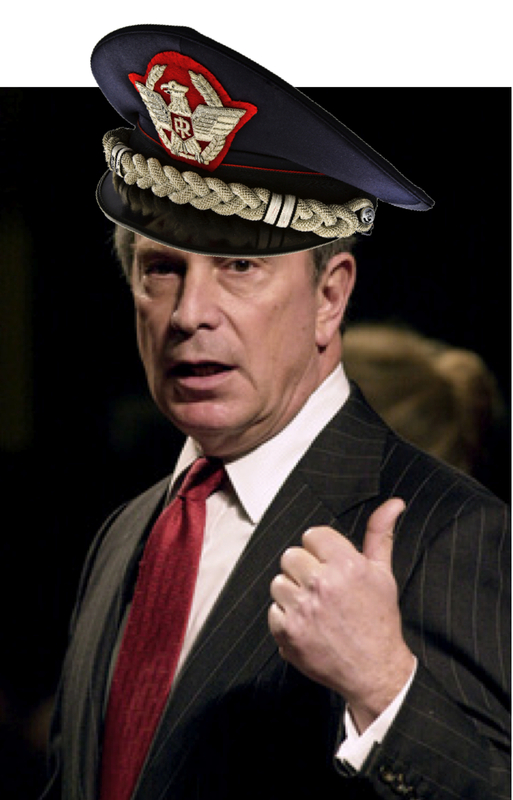 Emperor Don Pedro Magnifico Bloomberg has said he’ll challenge that court ruling. 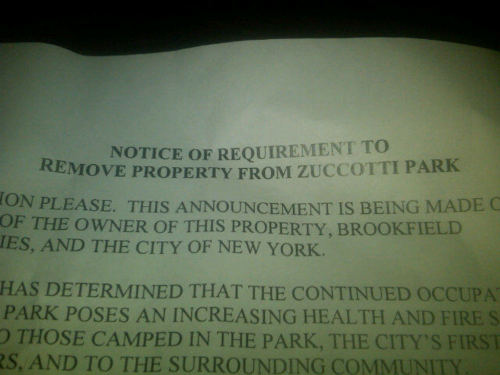 So, the legal battle for Zuccotti park is not over. But, in many ways, the larger struggle for hearts and minds in America is already being won. The 99% have raised their voices and are being heard. Big Brother may try to confiscate newsmen’s cameras and TV camera can be kept at bay – but the thousands of iPhones in the hands of Little Brother can capture the truth and post it for millions to see within minutes. You can’t evict an idea whose time has come. 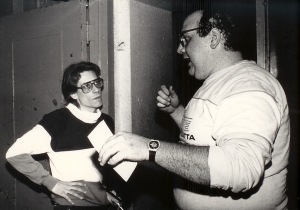 Louis DiCrescenzo (right) and Terry Shaughnessey backstage at "Bozo the Town". 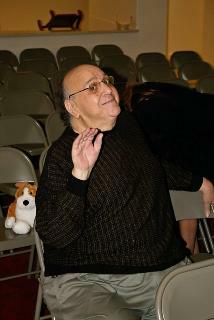 The one and only Louis DiCrescenzo, the gifted artist who designed and built both The John Lennon Auditorium at 703 Howard Street and The Piper’s Alley Theatre at North & Wells, passed away last week. 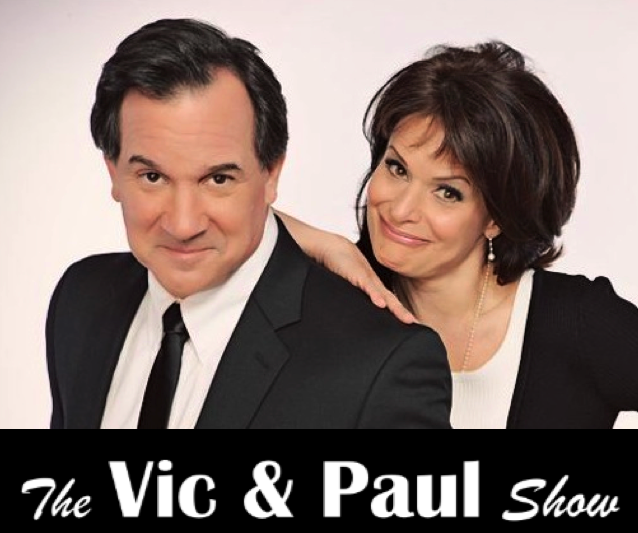 Brad Hall, his cast-mate in the original production of “Do Black Patent Leather Shoes Really Reflect Up?”, introduced Louis to The Practical Theatre Company in 1981. Louis’ imprint on the PTC was much, much larger than the big man himself. Louis D was larger than life. 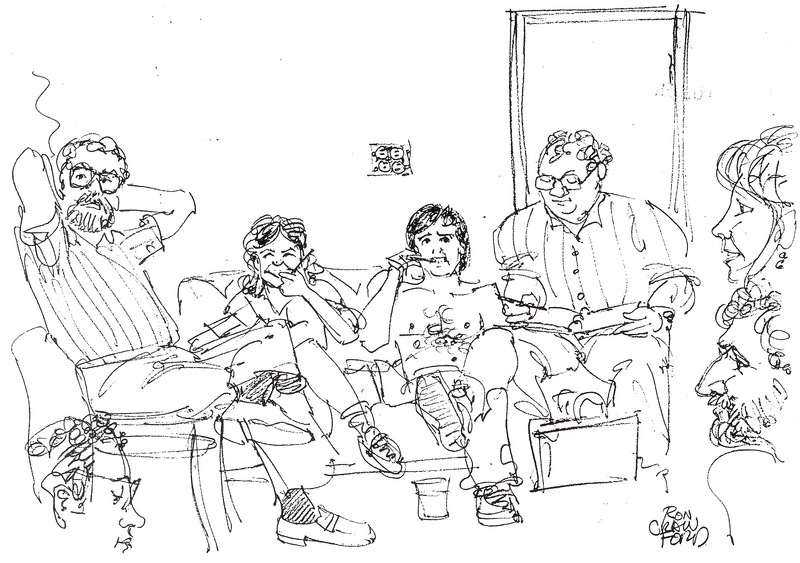 And we were glad to have worked, rehearsed, performed – and laughed – with him.